Just like his less experienced brothers (and sisters) the Widowmaker Marksmen is a sharpshooter with high RAT, however he brings a POW 12 weapon to the party that will keep solos and UA's on their toes. I think he a ton of applications that don't immediately jump out, most of them become more apparent as you team him up with other parts of your army (more on this later!). The biggest thing that stands out on the marksmen is his exceptional RAT. It's one point higher than our already accurate Widowmakers. He will hit most things and can stay on the move while doing it. Even high defensive models will sweat it out when he stands still for an aiming bonus. He also brings 5 damage boxes to the table, which can be nice is AOE's are heading his way. Also of note his his speed. When paired with Swift Hunter he can be quite mobile. Speaking of Swift Hunter, as long as other Widowmakers will gain this ability when in his control area. This effectively makes their threat range 16" as they can shoot and back up (if they kill something of course). One big benefit of the marksmen is his stealth ability. With his extremely long range weapon he can remain fairly safe as long as AOEs aren't thrown his way. Even then the change of rolling a 1 on the scatter is low and if they are throwing AOE's at him, then something else in your army isn't taking the hit. 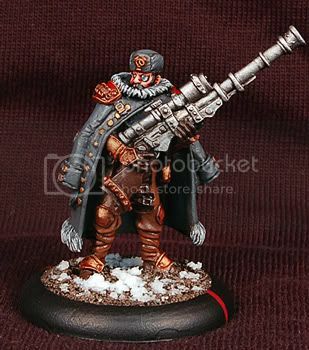 Seeing as Khador has many more immediate threats in their army this problem usually doesn't come up much. Finally I will touch on sniper very quickly. 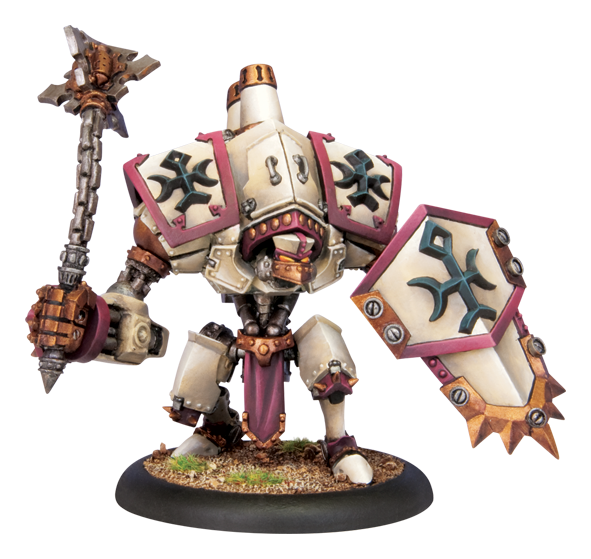 He has the ability to choose where he puts his damage on warjacks and warbeasts, or can simply deal 1 point of damage (which he can also chose where it goes). At first this doesn't seem like much, but he can reliably damage light jacks, especially arc nodes (I'm looking at you Cryx) and when teamed with Widowmakers they have a great shot at knocking out crucial boxes. Just like Widowmakers he also comes with Advance Deploy. I typically use this to simply place him last rather than in front of my army. This makes sure hes in the right place to take out his targets. Widowmakers - This is a fairly obvious choice as he grants them Swift Hunter when in his command range. As well as giving them swift hunter it can be another auto damage point to jacks or solos that require that magical 5 damage to bring down. Matching him up with any of the above is awesome and is almost always in any army I built. When you hit a heavy jack with one of the above you are usually a few boxes away from taking out systems. The widowmaker with his PS 12 gun on average can do a few points of damage to a heavy, and a moderate amount to a light. This will often be enough to cripple systems. A great boon and something the enemy usually won't see coming. I personal field a "detachment" of a `Jack Marshaled Destroyer with widowmakers + marksmen backing them up. I run them on the opposite side of the field and chew away at flanking units/jacks/solos. The Destroyer with power booster and `Jack Marshal can fire a boosted to hit and damage shell every round followed by the hail of 1 point damage can really cause headaches to an opponents jacks. He is actually a great solo to throw Fire for Effect on. His ability to choose where he damages can mean some pretty crippling shots on warjacks. Solos will also run for the hills. He can also hide with other infantry and shoot through them taking out key solos, just be wary of AOE's getting throw their way, or arc lightning. Similar to eIrusk but for one round he can help lay on some crucial damage during the feat turn. Everyone benefits from Signs and Portents, the widowmaker marksmen is no exception, especially with the sniper ability. Inhospitable Ground is awesome and greatly increases his survivability as enemies trying to run to engage him will find themselves short staring down the barrel of his gun. These guys greatly increase the hitting power of the Marksmen. If they can Harm a unit hes targeting its almost like having boosted damage rolls against them. Very handy especially with the Destroyer/Widowmaker combo I mentioned earlier. ~ I love the marksmen. Where as the Manhunter can be sort of a one time missile, the Widowmaker Marksmen can keep laying on the pain in crucial areas from the safety of 14 inches away. I almost use him with any caster I play as I can always find a use for him. Lately I've even been taking him over the Manhunter and it's been working out very well. I hope this helps anyone thinking about using him! Feel free to add your own thoughts and ideas! 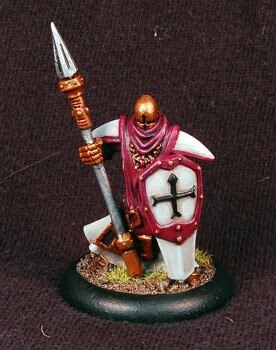 Hey Guys `n Gals, I just finished up my test mini for my Protectorate army. I thought I would discuss a little what went into his creation. So I was browsing the boards over at Privateer Press and I came across this lovely tutorial by Plarzoid. Forces of Warmachine: The Protectorate of Menoth Released - 2nd Faction Decided! 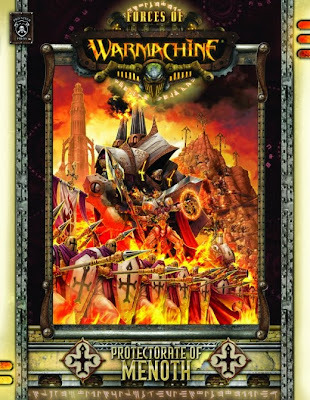 So another month down and another faction book released! I must say it's quite a beautiful book.